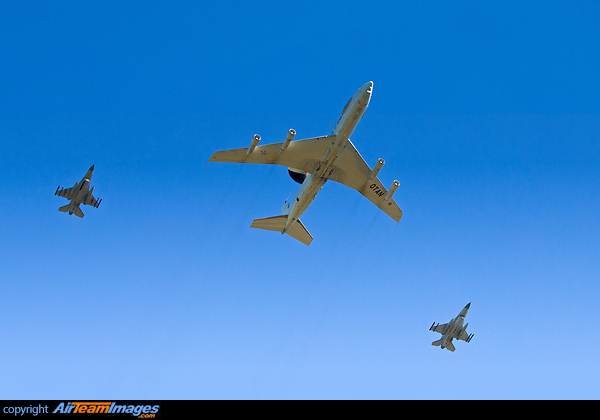 Flypast during the inauguration of the new NATO buildings in Brussels. The Boeing E-3 Sentry is a Airborne Warning and Control System (AWACS) roles include air and sea surveillance, airborne command and control, weapons control and it can also operate as an extensive communications platform. The normal crew complement of 18 comprises four flight-deck crew, three technicians and an 11-man mission crew. 4 x CFM CFM56 (18500 - 34000 lbf) or Pratt & Whitney TF30 (10750 - 20900 lbf) turbofan engines. USAF & NATO aircraft use the Pratt and Whitney TF33-PW-100A turbofan. The Royal Air Force, French Air Force and Royal Saudi Air Force all use the CFM International CFM56 turbofan engines.